Buy Microtek EM4160+ upto 1.5Ton AC Stabilizer Worth Rs 3,590 For Rs 1,649 only From Flipkart. 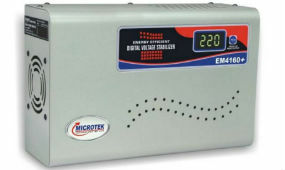 Microtek Energy Efficient Digital Voltage Stabilizers provide Protection to Air Conditioners (A.C.) against Voltage Fluctuations. All Microtek Stabilizers are based on Save Power Technology to give High Performance, Better Reliability during frequent Power Cuts and Voltage Fluctuations.